List of Mini Slow Cookers Available Online (under 4 quarts) , which are great for cooking large meals for pot lucks, meal prepping, or hungry families! Update: This is a massive list of small slow cookers and it's growing fast. There's a lot of content here, so I just wanted to pick a few models out that I thought were the best, so you don't have to go through the whole list. 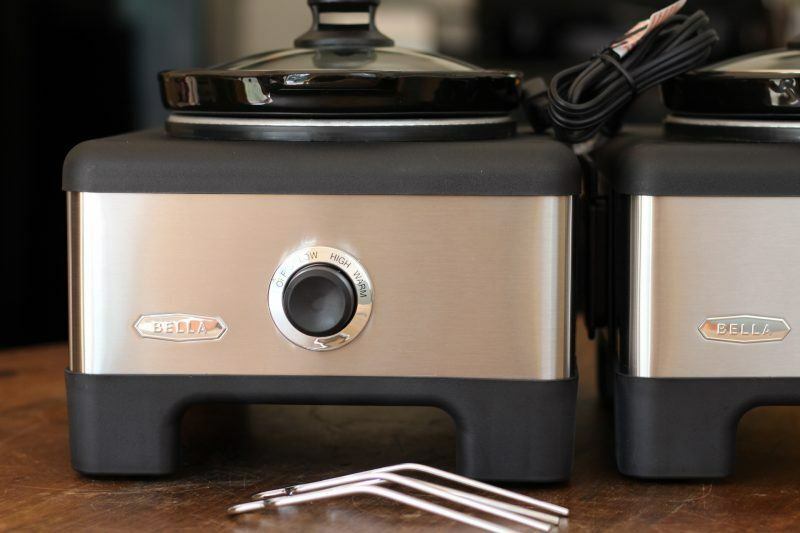 Which tiny cooker you get depends on why you're buying it. 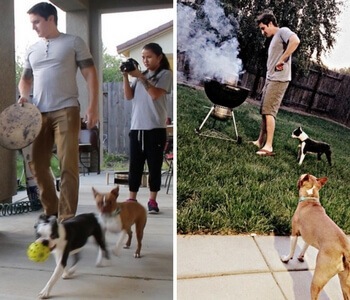 If you're a single person versus two people, you'll want different styles of cookers. Some people may just want a small cooker to heat up food at work. There are few on here that are best for serving small meals at pot lucks or events. Here are my picks, based on what you are looking for. Tiny pot for a single person: Crock-Pot 2-Quart (Black). It also comes in red, but the red currently costs 2x more than the black. They are on separate listings. You may be able to find a white or stainless one if you search. Medium pot for two people: Cuisinart 3.5 Quart Programmable (stainless). This is the smallest programmable slow cooker I could find. This particular model has lots of good reviews from other companies as well, and I did a full review here. Best portable small cooker: Crock-Pot Lunch Warmer. Not technically a “cooker” since it just keeps food warm, but best for transporting small meals. None of the mini cookers I could find had locking lids like the Crock-Pot Cook & Carry 6-quart (review) or the Bella 5-quart with locking lid (review). That's a review of the 6-quart version, but there's a 5-quart version available too. You could choose the casserole dish from below, which is 3.5 quarts and has a locking lid, but it's kind of weird looking and not really designed to be a “hot lunch” transportation thing. It's a casserole dish. Best for serving multiple dishes: Bella 2.5 Quart Connectible (comes with 2). This one's cool because you can add more to your system, and serve things like warm dips or hot sides in a buffet. I did a full review of this one too, right here. This model may look fairly basic but it is still a popular option on Amazon. Much of the appeal seems to come from the small size coupled with the low price. Additionally, the model does come with a ‘lid latch strap’, which is designed to prevent the lid from coming off during transit. So, this would be a good option for parties and the like, although at 1.5 quarts, you would be limited in what you could actually fit in the device. The biggest difference between this and the previous model seems to be shape. While this model is round, the other is oval. The difference isn’t huge but the shape of a slow cooker can influence the meals that you can cook. For example, you may find that some roasts will fit in an oval slow cooker but not in a round one, even if they both have the same capacity. This model is another option if you want something fairly inexpensive with basic functions. There isn’t much exciting about it and the brand isn’t as well-known as others but still, the slow cooker may be appealing for some. It’s also worth noting that the ‘auto’ setting just appears to be the same as warm on other brands. If you want a basic slow cooker, then this model is literally as simple as you can get. There are no temperature settings and the model doesn’t even have an on/off switch. Instead, you plug and unplug it from the wall. From the reviews, it appears that the temperature is the equivalent of low on other slow cookers, although there is some debate about this. The model does also seem to perform well, even though it only scores 3.8 stars on Amazon. From glancing through, it seems that most of the low reviews are because the slow cooker doesn’t have temperature settings or an on/off switch. While those areas are disadvantages, they are obvious before people buy the product. To be honest, I think the focus of this slow cooker is on color more than anything else. The functions that it offers are pretty basic and are roughly what you see for other models around this price range. However, the company does seem to offer a lot of kitchen products in the same color, making it appealing for people who like to color coordinate their kitchen. For that matter, the same brand has other models that are identical except for the color. This model is fairly similar to many of the others that we’ve mentioned so far and, like those, one of the key interesting aspects is the size. In particular, 1.5 quarts means that the model is best if you’re just cooking for one or are making dips or sauces, rather than actual meals. It is also a very reasonable model in terms of price and manages to look fairly elegant. If you’re looking for a small and basic slow cooker, then this model from Nesco is another option. It seems to be fairly popular on Amazon and even comes in a few different colors. Now, it’s not clear why the model says auto as one of the options. But, looking at what reviewers have to say, this is basically just the warm setting that you would find on other models. For the most part, this model is a fairly overpriced 1.5-quart slow cooker, especially as it has no settings or buttons to turn it on or off. However, the one redeeming feature is that this is designed to plug into a lighter socket in the car, rather than relying exclusively on a power plug. It’s easy to see the advantage for somebody who is traveling and wants a home cooked meal. However, outside of that specialized use, this slow cooker isn’t a particularly good choice and there are better options for your kitchen. As the image suggests, this slow cooker is small and doesn’t offer a keep warm function. The model’s one advantage is simply that it is inexpensive. However, there are other models earlier in this list that are the same size and price but also have the ability to keep food warm. If you want basic, this is another option that fits that bill. Like the Crock-Pot model earlier, this one has no settings and you simply plug or unplug it if needed. The one advantage is the low price. But, honestly, you can get a slow cooker with settings for a similar price. Plus, the model from Crock-Pot is less expensive again and gets significantly better reviews on Amazon. Toastmaster is a fairly obscure brand when it comes to slow cookers. That probably explains why there are no reviews of this model on Amazon at all. For the most part, it does seem like the slow cooker would work well, although there is no keep warm function. The price is good too, although I would still be wary about buying the product simply because of the lack of reviews. Visually, this slow cooker model looks pretty good, which is something to do with the combination of black and red. It offers the low, high and warm functions that you typically see and is a decent price for what you get. Chefman does also produce a number of other slow cooker models and seems to be popular, which may be a reason to pick this brand. Nevertheless, this particular model doesn’t have any reviews on Amazon, so it’s hard to know how well it actually performs. There isn’t much about this slow cooker that is unusual. Like many others, it has three settings (high, low and warm) and it also has an indicator light for when the power is on. The only unusual thing about it is the size, as 2 quarts is relatively uncommon compared to many other sizes. However, the model doesn’t get great reviews, so it’s probably better to look for a different product, especially as there is no shortage of mini slow cookers out there. Here is another 2-quart model, this time coming from Maxi-Matic. Compared to the previous slow cooker, this one does have better reviews. However, it is also considerably more expensive, despite having the exact same functions. At the same time, there aren’t enough reviews to really know how well the slow cooker actually performs. In terms of features, this model has the same offerings as the previous 2-quart slow cooker. However, it’s not really clear why this one is more expensive. You do find slow cookers in the price range and above, but they are typically larger with more features. Perhaps this is a hard-to-find model, or it's just low on stock. In contrast, this model seems pretty basic and the reviews suggest that the quality isn’t the great either. On Amazon, the average rating is 3.6 stars, across 18 reviews. That’s not horrible but with so many options out there, it isn’t hard to do better. El Paso is a common brand but not one that you’d typically associate with slow cookers. To be honest, the branding is the only real difference here, as the price and features are pretty similar to what most other manual slow cookers have to offer. Reviews suggest that the product performs well enough, although there haven’t been a lot of sales. This particular model is fairly basic, without even offering the ability to keep food warm. 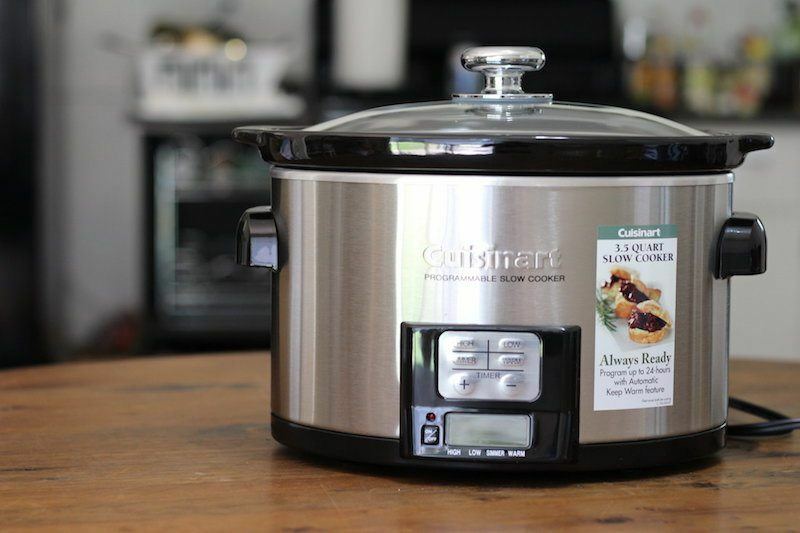 Still, like most Crock-Pot models it is fairly inexpensive and fares well on reviews. So, this can be a safe and simple slow cooker choice. The pattern is the only thing that really makes this slow cooker unusual. In fact, the underlying model here seems to be the same as the one above and the only change is in appearance. Still, the model is a good option for a decent slow cooker that isn’t too expensive. Plus, the pattern may appeal to you. On a side note, there other variations on this model that come up from time-to-time. For example, I’ve seen an autumn leaves version as well, although it was more expensive. In most cases, there isn’t any difference in functionality and Crock-Pot just seems to change the of the wrap slightly to appeal to more people. Crock-Pot certainly has no shortage of models out there and this is yet another option. This seems to be a fairly popular model and can be a good choice, especially as the price is reasonable. Essentially, this is just a slightly larger version of the models I mentioned before, although this one also has a keep warm function. There are actually two versions of this slow cooker, a 2-quart and a 3-quart. Both are fairly basic and they do look exactly how you would expect a slow cooker to. The one pictured here is the 3-quart model, which is fairly expensive given that it is almost identical to the previous model. On the other hand, the 2-quart model is less than ten dollars but only if you’re buying at least twenty five dollars in items at the same time (due to Amazon’s Add-on program). The smaller model doesn’t even have a keep warm function but it can still be a good entry-level slow cooker for some people. Needless to say, the most unusual thing about this model is the pattern, which does certainly stand out. There are also other options out there, including a multi-colored version and a one with black and white stripes. Regardless of the coloring, the underlying model tends to be the same, as does the performance. Now, this slow cooker is typical in terms of function and offers the low, high and keep warm settings. However, it does receive good reviews on Amazon and is more popular than many of the other models on this list. This particular slow cooker isn’t very popular on Amazon but that seems to be mostly because people simply haven’t tried it. When I used it myself, I was impressed with the overall performance and the food created. Plus, the indicator light is a nice touch and can help to prevent some mistakes. As I mentioned in my review, the round shape makes the slow cooker more compact but may mean that some recipes don’t cook well or that some ingredients simply won’t fit. Ultimately though, the slow cooker is a good option and you get something that will work well for a low price. This slow cooker is basically a lower-priced option if you were specifically looking for a 3-quart oval slow cooker. It has the same basic functions of low, high and warm, while also being reasonable in terms of price. But, that being said, the product has few reviews and it might be worth paying a little more to get something that you know is going to work well. This particular model is one of my favorite options for a small slow cooker and I’ve had good experiences with it myself. One of the key advantages of this model is that you get a decent number of features at a low price. This includes the standard options for low and high cooking, along with a programmable timer, an automatic keep warm mode and a simmer feature. The simmer feature is the most unusual one and it is basically another temperature setting that is below low. That option gives you the ability to cook soups and stews for an entire day – if you really want to do that. All-in-all, the model is a great choice for kitchens, especially if you plan to rely on a timer with your cooking. Plus, the slow cooker does produce some high-quality food overall. On a side note, I’m not the only one impressed with this model, as Amazon reviewers also give it a high rating and it sells well. The most interesting things about this slow cooker model would be the shape, combined with the size of the item. The marketing places strong emphasis is on creating casseroles and it’s easy to see how this slow cooker would work very well in that role. Additionally, the inner pot is oven safe, so you would have the option of browning a casserole in the oven if you wanted a crisp top. The slow cooker is also designed to be easily portable, which you can see from the handles and the clip top lid. The size would also be an advantage here, as it means that the slow cooker wouldn’t weight as much as many other options. Realistically, this is a slow cooker that would work best in some situations and not for others. Nevertheless, it’s an inexpensive choice if the size and shape appeal to you. This is another model that makes use of an unusual shape and is tailored towards casseroles. This time, the model is more expensive and 1 quart larger but the rest of the features remain essentially the same. The model does come in a range of colors and patterns although, as is often the case, the price varies with color. The slow cooker is also a popular one on Amazon, averaging 4.6 stars across almost 600 reviews. 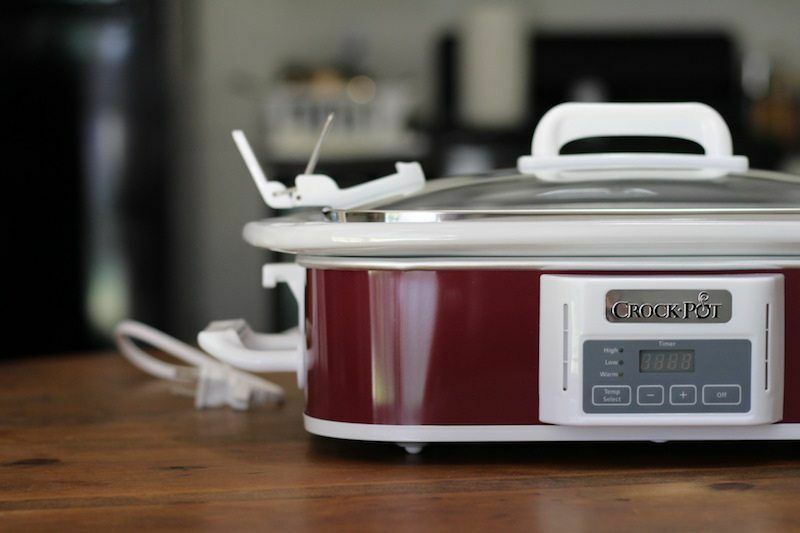 Beyond that, Crock-Pot has a decent reputation as a slow cooker brand, which also helps to make this model worth checking out. The biggest difference between this model and the previous ones is that here the slow cooker is programmable. This gives you the ability to set a timer for your cooking. Plus, the slow cooker will automatically switch to the keep warm mode once the time has completed. 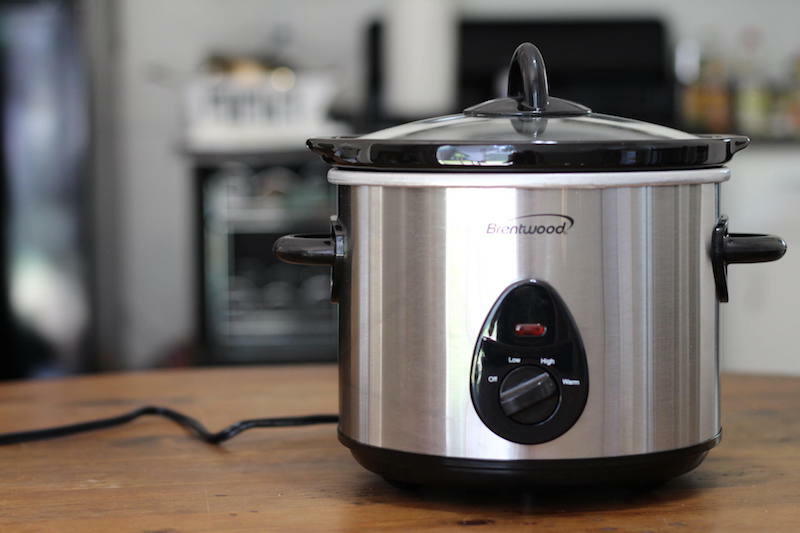 I reviewed this slow cooker earlier this year and was reasonably happy with it. The size and shape combination was probably my biggest issue, as this simply won’t work for everyone and suits some meals better than others. Still, the slow cooker does offer a nice combination of features and portability for a reasonable price, so it may be the perfect pick for some people. This model isn’t typical in any way. Crock-Pot itself still classifies this as a slow cooker, so I will too, although precisely how you define this model is debatable. Basically, the idea is to use slow cooker technology to cook and keep warm dips. The slow cooker has two settings, which are just off and on. Based on the concept, you’d expect the on setting to essentially mean keep warm. Instead, it actually cooks food, which makes it less than efficient for its intended purpose. Nevertheless, as a slow cooker, this model could be interesting, especially if you were cooking very small side dishes. But personally, I’d just stick to a typical small slow cooker instead. This slow cooker is unusual from start to finish, even in its design alone. To begin with, the pot itself is cast iron cookware and it basically sits on a heating base. So, this doesn’t function exactly like a normal slow cooker. The model also comes with a separate base which allows you to keep food warm without the slow cooker being plugged in. That base actually relies on a tealight candle. Visually, the product really does look good. However, the material and way that you cook do mean that some recipes may not turn out the same. Somewhat surprisingly, the product does receive pretty good reviews, averaging 4.3 on Amazon. While it may not work for all, this slow cooker could be appealing for some uses and situations. The VitaClay brand targets people who aren’t confident about using metal pots. So, you have a clay insert instead of a metal one. Theoretically, this means that there is no chance of lead contamination and many people do feel that the pots are safer. In this particular case, the model also has the ability to make yogurt, so there are the typical settings of high, low and off, along with an extra one for yogurt. However, there are some issues with VitaClay. One is the price, which is higher than a conventional slow cooker of the same size. Another is the durability. Typically, VitaClay pots tend to be less durable than regular slow cooker pots, so they can break more easily. Visually, this slow cooker looks quite different than what you might expect. Personally, I like the appearance but that isn’t really what’s interesting. Basically, you can get 1-quart, 2-quart and 3.5-quart versions of this slow cooker and they are part of a connectable system. This means that you can connect various slow cookers together, making an efficient system for parties or for cooking multiple dishes at the same time. As a slow cooker, the model has the basic options for high and low, along with a keep warm setting. So, the main advantage may be the ability to connect multiple slow cookers, but on their own, the model is still a good option for slow cooking. Additionally, the price is very reasonable for 3.5 quarts and customer reviews suggest that these work really well. This is a unique setup from Bella because although each slow cooker in the system has a 2.5 quart capacity, but is able to be connected and cook simultaneously to other cookers. Those cookers of course have to be one of the Slow Cooker Entertaining System, but it does add a lot of versatility to how you use these mini slow cookers. You can purchase each cooker separately, or as part of a 2-piece set. You can also add more cookers later on. Each cooker connects via a slide-in locking attachment on the side of the slow cooker. That means you can run multiple cookers off of just one plug. This is a great setup for entertaining, especially if you're serving multiple sides or dips in a buffet style dinner. I also experimented with cooking a small dessert using these models. The baked dessert too much too long to cook, so I wouldn't recommend making breads or cakes with a mini slow cooker. It takes too long to make a large enough portion – unless you are looking for a single serving in which case this would probably work.